*First published via email on Monday, February 25, 2019. Click here to subscribe. On Saturday, I went on a hike with my family and our dog, Tommy, then came home and gave Tommy a bath. Those are always full body workouts, haha! But all that clean fluffiness and extra bonding time with my dear old, vision-impaired Tommy dog is worth all the screaming (mine) when he shakes and flings water everywhere, wiping up the entire bathroom afterwards from top to bottom, and coming out looking like I just went through a hurricane. I'm going to miss him. I'm going to miss my family. I'm going to miss my friends. 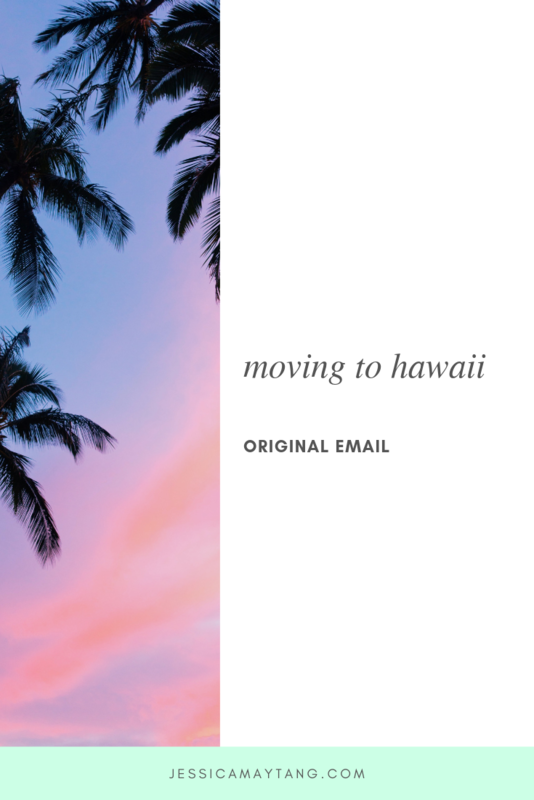 WE ARE MOVING TO HAWAII!! What?!?! Melo, my brother, and I are jumping ship off the mainland and moving to Oahu. IN 4 WEEKS. My brain is still reeling from all the feels. It's strange how before, I've always looked forward to every single move of mine, but this one feels different. WHICH IS SO GOOD. All the other times I've moved, I've been more than excited, but mostly because I was getting away from where I had been living. Come to think of it now, I was always in a big of a rut right before a move. I guess it makes sense. The only problem was that I always had a feeling I was running away from something. We don't have a place to live yet. We are shipping our cars over and praying they get there on time. We gave ourselves a week to stay in an Airbnb before finding an apartment for the 3 of us to live in and move into. Two of us (including me) don't have jobs in the bag yet (meaning no contracts have been signed yet). We've all only been to Oahu once in our lives (and I hated it). AGHHHH!!! So you might be asking THEN WTF ARE YOU MOVING, JESS? Because one of us got a really great job opportunity and we all want to experience that aloha lifestyle. All 3 of us are a bit overwhelmed by the go-go-go status- and money-focused mentality of the Bay and are looking for something more chill, community-based, and small-town-friendly. Anyway, that's my exciting news! Andddd....switching gears to the podcast. :) God knows the last couple weeks for me have been all about setting personal boundaries and handling shame and guilt afterwards. So in the new episode this week, I talk about how when we share our boundaries, they're unfortunately (or fortunately) not always received with good feelings, so it's very common to feel ashamed or guilty afterwards. In this episode, you'll learn how to differentiate between the two emotions so that you can move through each one successfully. CLICK HERE to listen to this weeks' new podcast episode - LY 46: Shame & Guilt After Sharing Boundaries. what do you want/need to be happy?